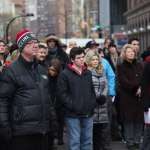 It was a seasonably chilly and overcast day, but a large, enthusiastic crowd of alumni, students, faculty, and staff gathered on February 9th to honor our Founder and participate in an afternoon of festivities hosted by the school. The traditional wreath laying ceremony began outside at Cooper Square with opening remarks by Richard Lincer, Chairman of the Board of Trustees. 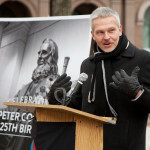 Lincer welcomed the crowd, reflected on Peter Cooper’s profound legacy, and spoke about the ongoing efforts of the recently-formed Free Education Committee. 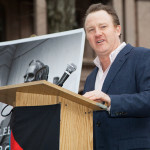 Next up,Tracy Brown – great great great grandson of Peter Cooper – announced a Senior Class Challenge, generously funded by descendants of Peter Cooper and intended to encourage this year’s graduating class to give to the Annual Fund. The Challenge provides for up to $15,000 in additional donations based on the number of seniors who donate and the total amount raised by the class. Additional details will be forthcoming soon. Addressing the crowd next, CUAA President Nils Folke Anderson A’94 remarked, “What a difference a year makes.” He continued by stressing the importance of re-doubling our collective efforts to ensure that continued progress is made in the year ahead. He pointed to increased participation in the Annual Fund as a promising sign that indicates healing within the community and directly benefits the school. 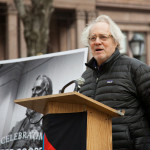 The last speaker of the day was Cooper Union’s Acting President, Bill Mea. 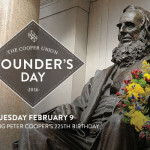 He described having heard myriad stories from alumni about the dramatic impact the school has had on their lives, and how these powerful and emotional stories have emboldened and strengthened his resolve to fight for Cooper Union and preserve its legacy for future generations. 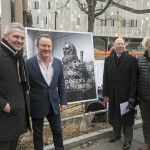 Mea announced the launch of an exciting new initiative to collect and preserve these stories, and to use our collective narrative as a force to bring Cooper Union to the world. 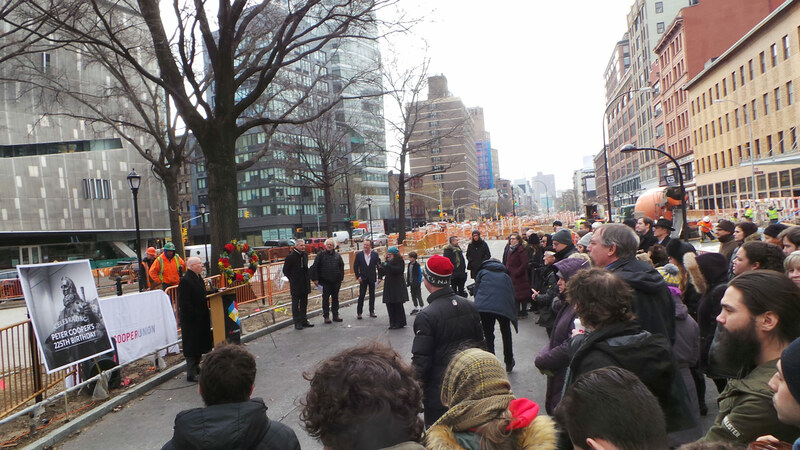 To read more about this project and share your story, click here. 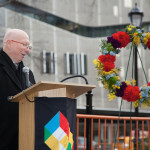 Bill Mea then passed the maroon and gold floral wreath over the construction barrier surrounding Cooper Square, and it was placed on the statue of Peter Cooper, as is tradition. 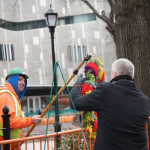 Following the laying of the wreath, students, alumni, faculty and staff went inside to warm up and were treated to hot chocolate, cider, and cupcakes. 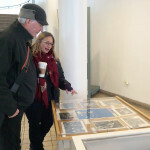 A fascinating display of memorabilia from The Cooper Union Library Archives included photographs and ephemera from previous Founder’s Day celebrations, going back over 100 years. 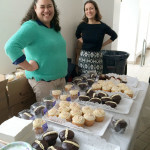 Late in the afternoon, students and alumni regrouped for a Mixer back in the Foundation Building lobby, enjoying sandwiches and dessert together. 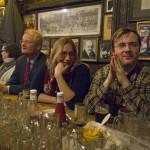 Following the activities at the school, alumni gathered at McSorley’s Old Ale House along with Bill Mea and staff members to reminisce, share our stories and hopes for the future, and to raise a glass to our Founder, Peter Cooper. 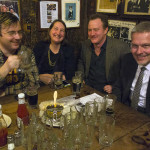 Indeed, what a difference a year makes! 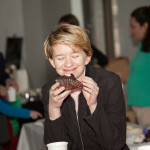 For more photos, visit Cooper Union’s Flicker page. 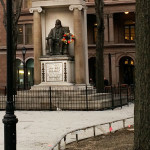 This entry was tagged Founder's Day, Wreath Laying. Bookmark the permalink.